Enjoy the live view (weather permitting) from any of the eight skycams provided by NBC 5 in the video players below. For optimal viewing, please play one skycam at a time. The Trinity River and Fort Worth's historic courthouse can be seen from the skycam below that overlooks Fort Worth from the Villa de Leon Condos. In the player below you'll see the Dallas skyline from Lake Cliff Tower. 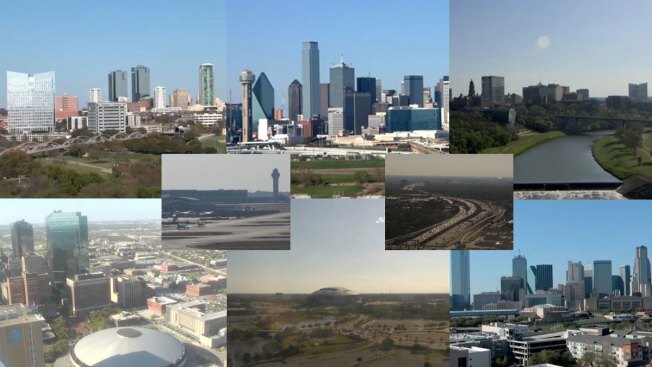 The camera gives a view of the iconic buildings that make up the Dallas skyline. Enjoy the live view of Fort Worth's West 7th from The Stayton at Museum Way in the player below. Located in the heart of the Cultural District, The Stayton at Museum Way is a new resort-style retirement community that overlooks Fort Worth's new 7th Street Bridge and Montgomery Plaza. Another view of Dallas' skyline appears in the player below, with the Comerica Bank tower to the right, AT&T headquarters in the middle and Renaissance Tower and Bank of America Plaza to the left. From the Fort Worth Omni Hotel you can see Downtown Fort Worth in the player below. Traffic looking west on Interstate 635, the LBJ Freeway, can be seen in the player below. The north side of Dallas/Fort Worth International Airport can be seen in the player below. GlobeLife Park, the home of the Texas Rangers, can be seen in the player below as well as cranes in the construction zone of the the new ballpark next door.